Samson Donick in May 2016. What if every defendant received the same compassion Samson Donick did? Donick, 22, was set to go on trial last Thursday for sexually assaulting a woman as she slept in her Boston University dorm room in 2015. But the victim told prosecutors she could no longer face having to take the stand. Under a plea deal, Donick was sentenced to five years’ probation, avoiding jail. Implicit in that enormously kind — maybe too kind — statement is the notion that Donick is more than the crime he committed, that he has potential that should be realized, that he is capable of redemption. 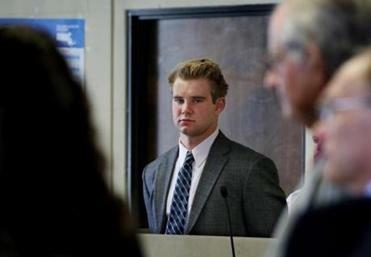 A former MIT basketball player avoided jail time Tuesday for sexually assaulting a woman as she slept in her dorm in 2015. We’ve also seen others accused of sexual assault receive the benefit of the doubt in local courtrooms recently. Earlier this month, IRS agent James Clarke was arraigned in Suffolk Superior Court on charges that he handcuffed a 21-year-old intern in his government-issued car, shoved his service weapon into her mouth, and raped her. The prosecutor asked that Clarke be held on $10,000 bail, but a judge in that case released the defendant on his own recognizance. And on Friday afternoon, transit police officer James Floyd, 60, pleaded not guilty in Boston Municipal Court to two counts of indecent assault and battery, one count of assault by means of a dangerous weapon, and one count of witness intimidation. He allegedly walked up to a ticket agent at North Station, grabbed her by the shoulders, thrust his pelvis into her buttocks, then threatened her with his baton before repeating the assault on another woman. A judge disagreed with a prosecutor’s contention that Floyd should be held on $10,000 bail, and released him on personal recognizance, too. Maybe it’s just a coincidence that all three of these men are white. And perhaps each of them, appalling as their alleged acts were, truly does deserve the benefit of the doubt. But it makes you wonder: What would our justice system — our country — look like if we saw the potential in every defendant, if the possibility of redemption lived in every courtroom, no matter what the accused looked like? Of course we don’t, and it doesn’t. The criminal justice system sees far less worth in black defendants than in white ones. Bail is imposed more often on black defendants than on white people accused of the same crimes. Whites are more likely to be released on personal recognizance, which means judges more often trust them to show up for their court dates. More black defendants await trial in detention. A 2015 MassINC study showed that black residents are hugely overrepresented in pretrial detention in Massachusetts, and have higher bails set for them. In Barnstable County, African-Americans’ share of pretrial inmates is 10 times their share of the general population. The median bail amount for African-American defendants in Berkshire County is five times higher than for white defendants. Studies in other states show black defendants are more likely than whites to be offered plea deals that include prison time. Pile up all of these facts, and it’s hard to avoid the conclusion that those who control their fates see black defendants as more dangerous, and less trustworthy, than whites. We’re finally seeing efforts to counterbalance that prejudice: District attorneys here and in other states have stopped asking for bail for minor offenses. A criminal justice reform law signed by the governor on Friday may help, too. All of this could narrow the yawning racial gaps in our justice system. But nothing will work as well as this: seeing the humanity in every defendant that Donick’s victim saw in him.